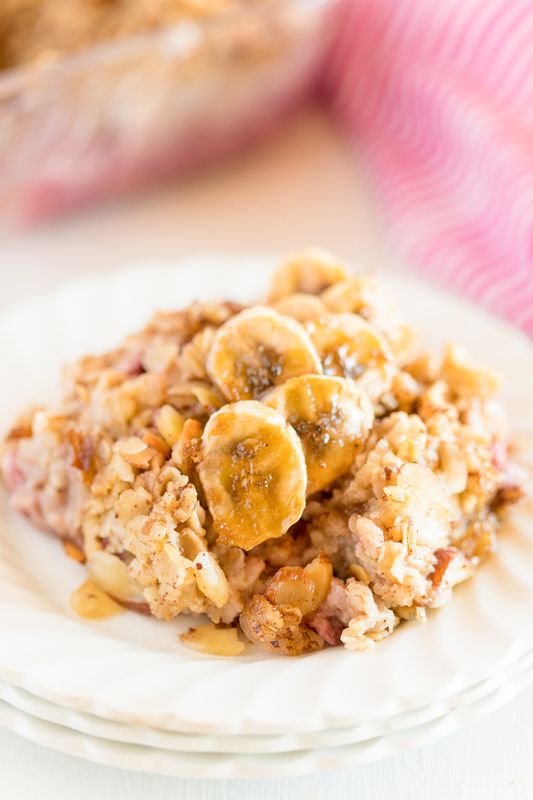 This Raspberry Almond Baked Oatmeal is an easy and delicious breakfast recipe, add bananas for extra flavor! 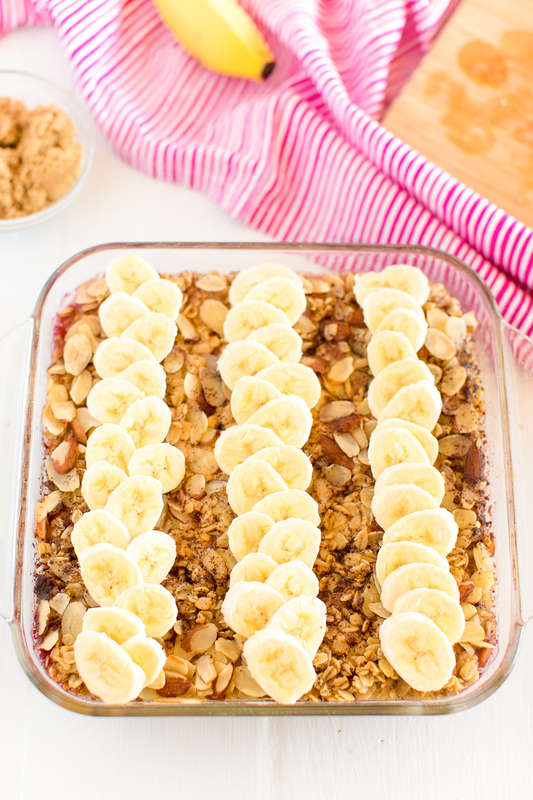 It can be hard to make wholesome breakfasts that the family loves, but Raspberry Almond Baked Oatmeal is a game-changer! Waffles, pancakes, and French toast are always delicious, but sometimes, you may want a healthier option. 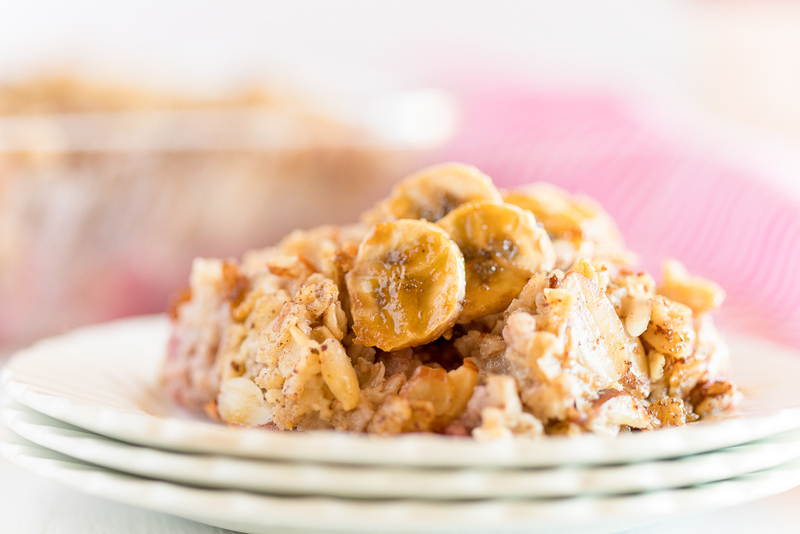 This Baked Oatmeal Recipe has all the heartiness of oatmeal with just enough sweetness. 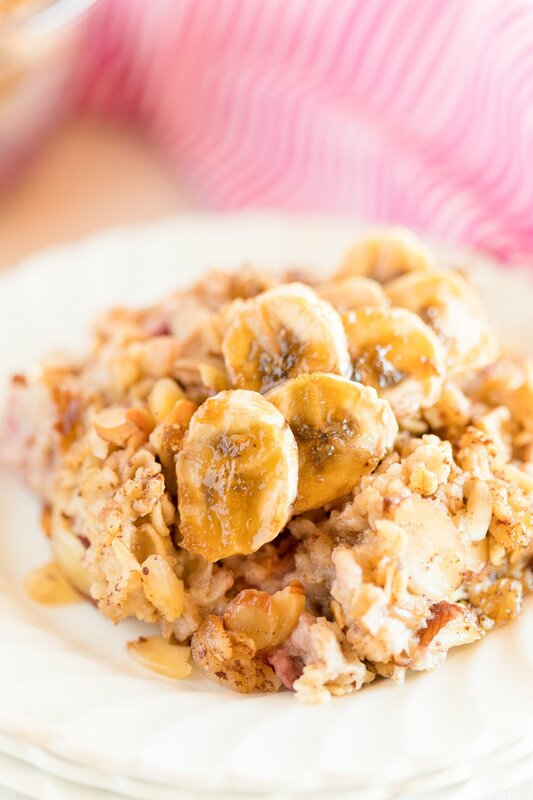 This yummy breakfast dish is baked with oats, unsweetened almond milk, water, coconut oil, and an egg. It’s also flavored with juicy red raspberries, almond extract, and brown sugar, plus a touch of warm cinnamon and nutmeg. This is a simple dish to make. You’ll begin by toasting your almonds, if desired, you don’t have to but it does enhance the nutty flavor they will add to the dish. Then you’ll add the frozen raspberries to the baking dish, making sure to spread them evenly so they cover the bottom of the dish. Next, you’re going to sprinkle the oatmeal evenly over the top of the raspberries and then sprinkle your almonds (toasted or not) over the top of the oatmeal. Then you’ll want to whisk together your almond milk, water, brown sugar, egg, coconut oil (or butter), almond extract, cinnamon, and salt until smooth. Gently pour the mixture evenly over the top of the ingredients already in the baking dish. Do not stir and try to avoid disturbing the distribution of the raspberries, oatmeal, or almonds too much. Bake until the liquid has been absorbed, about 25 to 30 minutes. 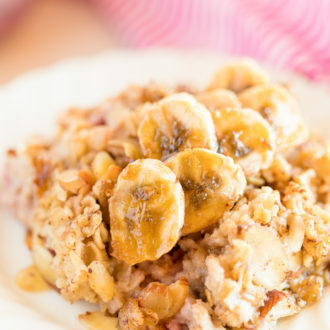 If you’d like to add bananas to this dish, slice them into rounds and arrange them on the top of the oatmeal. 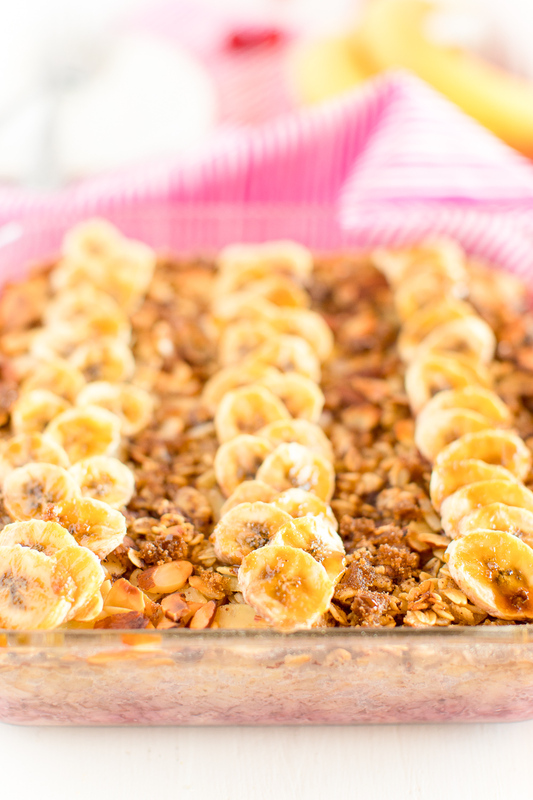 Sprinkle the brown sugar and nutmeg over the top of the bananas and broil the Baked Oatmeal for a few minutes to caramelize the bananas. While I love the blend of raspberries and almonds in this recipe, you could easily make this with a bag of mixed berries, strawberries, or blueberries if that’s your preference. It’s easy to swap out almond extract for vanilla extract or use unsalted butter instead of coconut oil. You can also use another milk alternative or even whole milk if you’d like in place of the almond milk. But I really love having all the different layers of delicious almond flavor! This yummy breakfast is great for a healthier brunch option to make for the family on the weekends. But with just enough sweetness and a dessert-like texture, the kids won’t even suspect it’s good for them! I especially love this comforting dish in the wintertime. When it’s cold outside, there’s nothing like a steaming hot breakfast on a frigid morning. 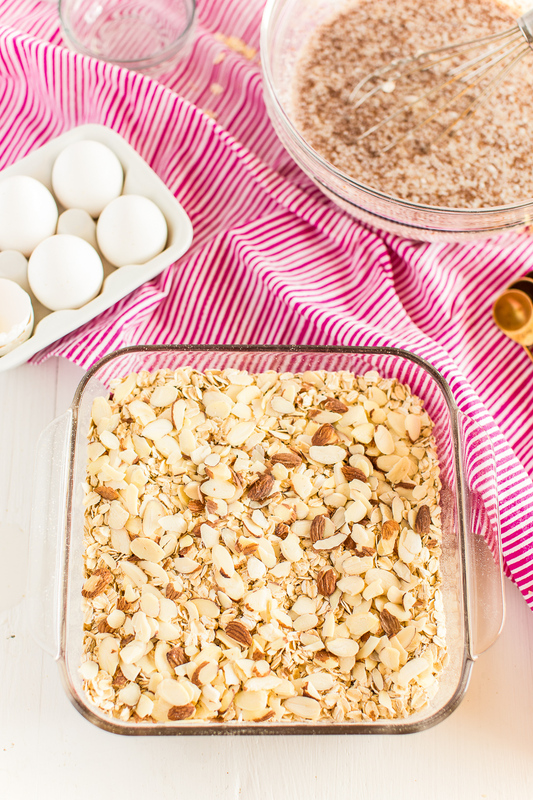 Paired with a mug of steaming coffee or tea, cozy Baked Oatmeal will warm you from the inside out. Sometimes, I even like a scoop of this stuff as an afternoon pick-me-up. It also makes a great after-school snack that’s healthier than chips or cookies. They say breakfast is the most important meal of the day. But sometimes, it’s the hardest one to get your family (or yourself!) to eat! 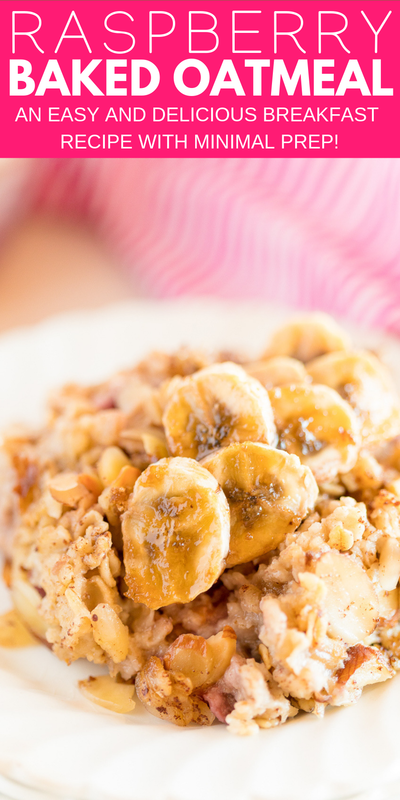 Whether you have picky eaters or you need a healthy breakfast or brunch option, your family will love this fruit-filled Raspberry Almond Baked Oatmeal Recipe! Preheat oven to 350 degrees F and arrange almonds in a single layer on a large baking sheet and bake for 4 minutes to lightly toast. Remove from oven and set aside. 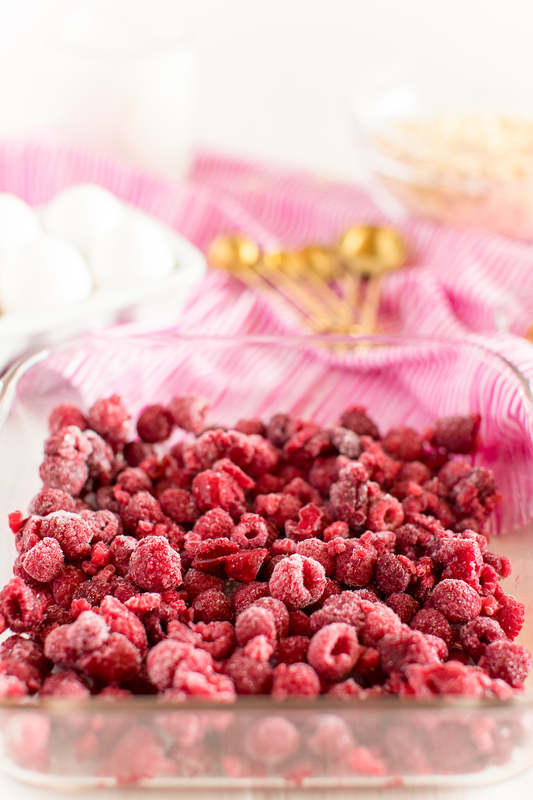 Increase the oven to 375 degrees F.
Add the raspberries in an even layer in an 8×8 or 9×9-inch baking dish. Sprinkle the oatmeal over the top of the raspberries in an even layer. Then sprinkle the toasted almonds over the top of the oatmeal in an even layer. In a large bowl, whisk together the almond milk, water, brown sugar, egg, coconut oil (or butter), almond extract, cinnamon, and salt until smooth. Slowly pour the almond milk mixture over the raspberry, oatmeal, and almonds making sure not to disturb them. Place in the oven on the middle rack and bake until the liquid has been absorbed and the edges of the oatmeal are bubbly. About 25 to 30 minutes. 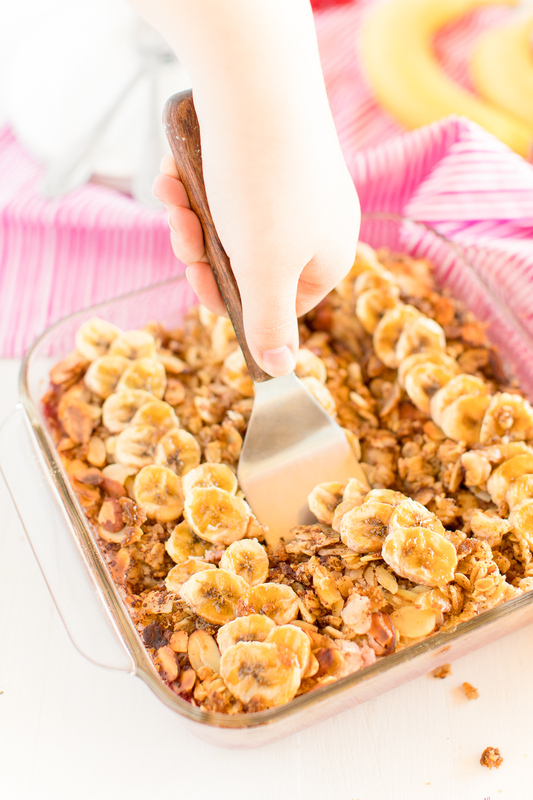 If you want to add additional depth and flavor to your baked oatmeal, slice up the bananas and arrange the slices so they are slightly overlapping in circles or lines on the top of the baked oatmeal. Mix together the light brown sugar and nutmeg and sprinkle over the top of the bananas. Broil on high for 3 to 5 minutes until the bananas are bubbly and lightly caramelized. 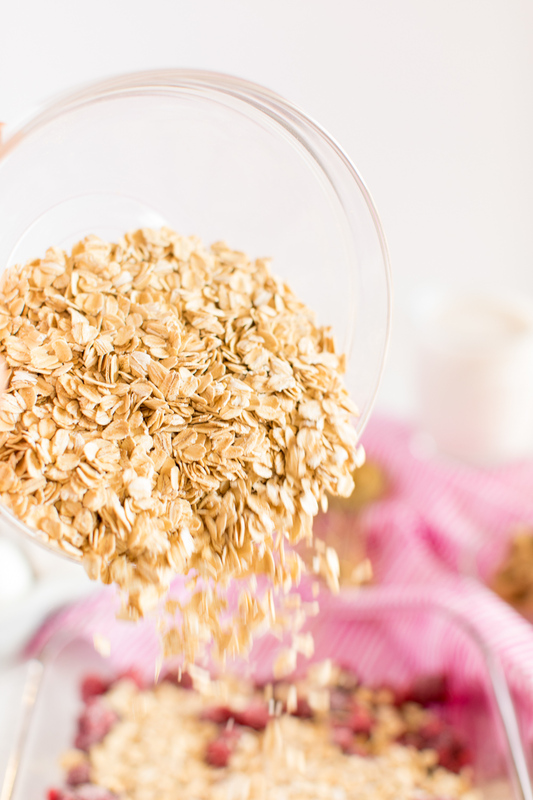 Remove from oven and allow the oatmeal to cool for about 20 minutes before serving. Nutritional information is an estimate without the banana topping. Vanilla extract may be used instead of almond, but this will have a big impact on the flavor, but it will still be delicious. Melted unsalted butter may be used instead of coconut oil. However, this means the dish is no longer vegan. Other kinds of milk may also be used.